Neither James nor I were particularly satisfied with the way that our first round of Soju drinks came out, and as such, we had an emergency mixing session last night. The Bird’s Eye Julep was probably the best of that set, from my perspective, but all of the others, though the flavors were good, lacked a certain essential kick. High alcohol wines and mixed drinks have a flavor “pop”, and that sensation of pop is caused by the burning sensation from drinking ethanol. Soju drinks are relatively low in alcohol content; an ideal mixed drink hovers around twenty-seven to thirty-five percent alcohol* (can’t remember where I read that), but I think it is certainly true. Soju itself is only twenty-four percent, perhaps less after being infused with fruit, and that means that it starts out already below our target window. The Bird’s Eye Julep did pop, and that’s why I like it more than the others. For our second round, we made the vital discovery that a teaspoon of chile-infused Soju can restore the sensation of pop to a soju-based drink. If we substitute the burning sensation of ethanol with that of capsaicin, your brain is fooled, and the drink has the distinctive kick of a proper mixed drink. This is what we call a breakthrough. Moreover, we had lamented our lack of highball drinks in the first round, and James had the clever idea to use Singha, a Thai lager, for the carbonated component of the drink. Everyone loves a good beer cocktail, I know I do, and the use of a Thai beer really fed into the unity of the theme. In all honesty, Singha is not substantially different from any other yellow fizzy lager, but I take a certain pleasure in knowing that it comes from the same region as the other flavors. Shake all but the beer over ice and double strain over fresh ice into a Collins glass. 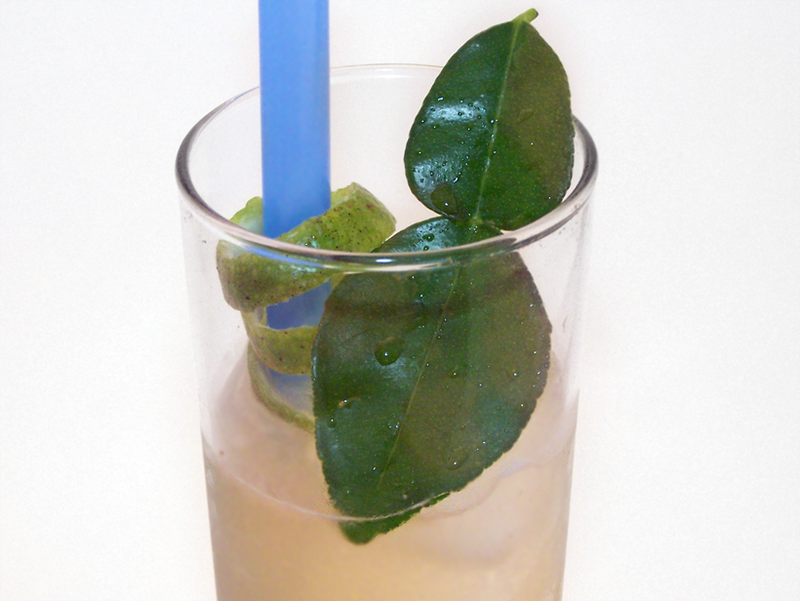 Top with 2 oz Singha and garnish with a lime twist and a pair of Kaffir lime leaves. When I made the drink for myself, I used only .5 oz of simple syrup, and indeed, the drink was quite tart. Some folks might like it that way, but I think the additional quarter ounce of simple syrup makes the drink much more accessible, and more suited for a restaurant. That little bit of Thai chile is more important than any dash of bitters to the success of this drink. It was delicious, and neither James nor I could stop drinking it. Another note on technique: Since the soju is already lower proof, we want to dilute it less than we would a drink made with high proof spirits. For most shaken drinks I count out thirty three shakes, but for this second round I counted only sixteen. It was a marked improvement. For our second highball, we ventured into slightly more experimental territory. James’ girlfriend, Erin, had suggested Thai tea syrup to him, and we decided to go ahead an make it for the second round. I myself had wanted to incorporate the flavor of Thai tea into a drink during our first round, but I was also making two punches for a party later that day, and so I had a lot on my mind. Simmer for fifteen minutes until the syrup is rich and the tea is deeply extracted and concentrated. Fortify with 1 oz of Everclear. This was one of the better syrups we have made lately. I can’t wait to use it in a couple of drinks made with high proof spirits. Shake all but beer over ice and strain over fresh ice into a Collins glass. 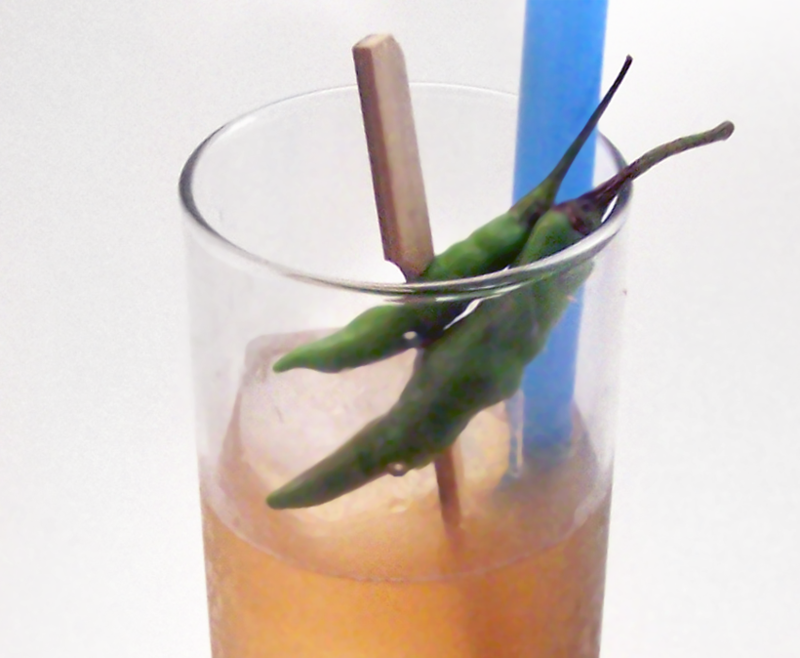 Top with 2 oz of Singha and garnish with two Bird’s Eye Chilis on a bamboo skewer. The Thai tea brought a richness of flavor to the Chili-infused Soju almost reminiscent of a barrel-aged spirit, and the flavor of the chili mixed exceptionally well with the beer. The beer coexisted peacefully with the Lemongrass/Galangal/Kaffir lime leaf-infused soju, but club soda would probably have worked equally well. In contrast, the flavor of the chilis harmonized wonderfully with the beer, and both played nice with the Thai Tea. I’m pretty sure this is my top drink of the week. Since we made so many Thai drinks, we have decided that we will be doing bonus posts this Saturday and Sunday, with our final menu on Sunday. Stay tuned! Categories: infusions, original creations | Tags: alcohol, bartending, beer cocktails, bird's eye chili, booze, cocktail, cocktails, collins, drinking, drinks, galangal, highball, kaffir, kaffir lime, lemongrass, lime, lime leaf, mixed drinks, mixology, simple syrup, singha, soju, thai, thai chili, thai tea, tom collins, tom kha | Permalink. The addition of chilis for bitters is a good idea….we will be playing with our kaffir lime leaves and will try some riffs on these cocktails…Not sure we can get Singha, but can sub another lager..
It’s nice how products from the same culture harmonize well. Nice cocktails! I had soju for the first time about a year ago. I really enjoyed it as is, but these cocktail ideas seem really interesting. That last one with the chili skewers is blowing my mind. Great ideas!